↑ 2.0 2.1 2.2 2.3 "Tanzania". International Monetary Fund. Retrieved 2012-04-22. ↑ "Gini Coefficient". CIA World Factbook. Retrieved 2012-01-25. ↑ Tanzania. Dictionary.com. Dictionary.com Unabridged (v 1.1). Random House, Inc. (accessed: 27 March 2007). 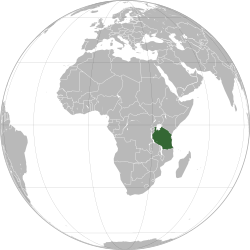 This approximates the Swahili pronunciation [tanzaˈni.a]. However, /tænˈzeɪniə/ is also heard in English.